Officials from the Chicago Department of Public Health (CDPH) confirmed that soil samples taken from Southeast Side homes near the S.H. Bell facility show substantial toxic manganese contamination, with at least one sample reaching more than twice the U.S. EPA’s removal level used to identify soil that needs urgent cleanup under the federal Superfund law. 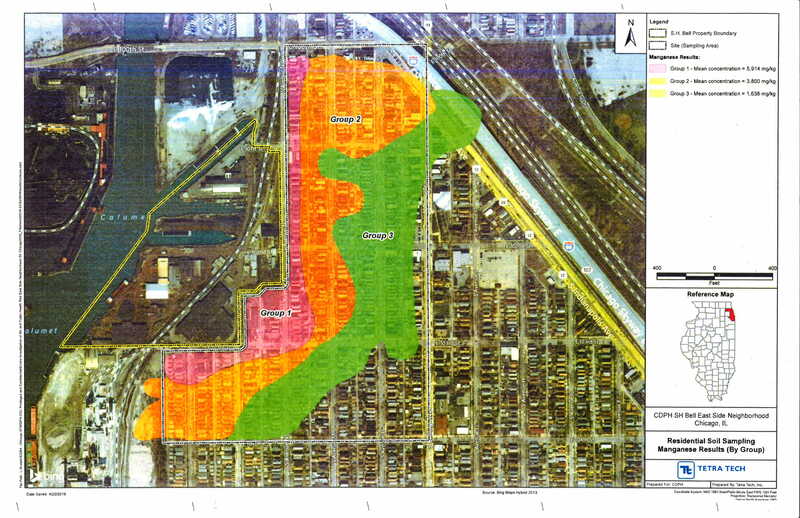 Prompted by residents’ call for action to address manganese air pollution in the community, the City’s consultant tested soil from Southeast Side residents’ homes this past winter to help confirm whether manganese has been leaving S.H. Bell’s boundaries. The soil testing was done in conjunction with air monitoring at S.H. Bell, in place since last year. The air monitoring showed high levels of manganese this past summer, resulting in a Clean Air Act Notice of Violation issued by U.S. EPA to S.H. Bell in August 2017. City officials convened a meeting on Tuesday with state and federal environmental and health agencies, Alderwoman Sadlowski-Garza, representatives of Sen. Durbin’s and Illinois Attorney General Madigan’s offices, Southeast Side residents, and other advocates to discuss the soil test results and plans for continued collaboration to further identify the scope of the problem and appropriate response. Officials from CDPH notified residents that the City has asked the U.S. EPA for further testing that could result in soil remediation. On the same day, CDPH and Alderwoman Sadlowski-Garza began contacting residents from the 27 homes that were sampled near S.H. Bell to notify them of test results and the health risks associated with manganese pollution. City officials indicated that a public meeting on the Southeast Side will follow shortly, with government officials to discuss test results, health risks and next steps, and provide an opportunity for community members to ask questions and voice concerns. “Neurotoxic manganese is contaminating the soil of our homes, schools and parks. How can we feel safe letting our children play in our yards or go outside? The City must immediately adopt a moratorium on handling manganese in order to protect the health of the community, and polluters like S.H. Bell should clean up the contamination that they’ve left at our doorsteps. We also expect that the EPA will evaluate the extent of the contamination as quickly as possible. “Still, Chicago’s Department of Public Health has not properly equipped health care providers to talk to their patients about exposure to this neurotoxin. Concerned community members don’t know who to turn to for questions on treatment or the dangers of exposure to manganese. “The City must issue a moratorium on all new industrial permits – including those in planned manufacturing districts and those for planned developments, bulk storage handlers and warehouses – until it adopts a comprehensive set of ordinances and rules that incorporate upfront the voice and vision of the impacted communities. The Natural Resources Defense Council (NRDC) is an international nonprofit environmental organization with more than 3 million members and online activists. Since 1970, our lawyers, scientists, and other environmental specialists have worked to protect the world's natural resources, public health, and the environment. NRDC has offices in New York City, Washington, D.C., Los Angeles, San Francisco, Chicago, Bozeman, MT, and Beijing. Visit us at www.nrdc.org and follow us on Twitter @NRDC.